I have always loved the way things connect to make a whole. One of my favorite memories as a little girl was a time with my family, walking through the Henry Ford Museum in Michigan — staring for as long as the adults would let me, at the intricate doll houses representing various periods in American history. Every detail mattered. Tiny dishes, intricate wallpaper and miniature furniture. I had never seen anything like it. I wished we could have stayed in that one room all day. Sometimes when I stare in wonder at the pieces of God’s story, and get a glimpse of how every detail matters, it reminds me of the dollhouses. I don’t want to miss anything. I want to linger a little bit longer to see what else I can see – those things that maybe I missed the first time. Over the past year, the way Hannah’s story has come alive again in Mary’s story is a link that has captured my attention. The details in Hannah’s story mattered for Mary. The very words she used when she prayed modeled words of praise for Mary. I love those instances when a story seems wonderfully complete, but God is thinking thousands of years down the road to when that first story will make another story richer. We will come back to Hannah and Samuel’s story in a couple of weeks for more connections to Mary’s story. In the meantime, what are the stories that are serving as tutors for your story these days? What stories are you telling the children in your care or under your influence? How will you instill within them the belief that God wants to keep telling his story through them? Wow! Humbling and though-provoking. Thank you for the challenge to share His story within our lives, to those we come in contact with. Cindy – can I send you a copy of the book? Message me your address. You have been sharing this Story with your life for a long time! I am loving your book and the invitation to ponder aspects of my life with the One who loves me during this season of celebration. Thanks Lucy! I love loving the Story with you! Each time I read your comments or another page from your book, I am amazed and grateful for all of the places your words take my thoughts! Each of us has a story. Our stories impact the lives of our children and theirs…and theirs. Brings to mind the song “Mary Did you Know?” … one of my favorites. 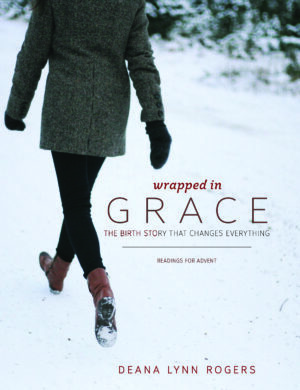 Your wonderful book has changed the Christmas season for me this year Deana…and I am so thankful!!! Sue, I love that song too – what did she know? What a daily step of faith it must have been to be His mom. I love that we are sharing this season together. The Christmas story changes me every year – so glad that it is changing both of us!